Follow us for Holiday reminders thru Twitter! 114th day of the year. There are then 251 days left in 2019.
on the 17th week of 2019 (using ISO standard week number calculation). 36th day of Spring. There are 59 days left till Summer. April 24, 2019 is the 5th day of Passover (Jewish Observance). 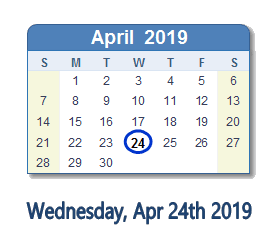 What happened on April 24th 2019?